The Air King AK110LS Energy Star Deluxe Quiet Series Bath Fan provides cost effective, energy efficient ventilation at low sound levels and features a contoured grill that almost disappears into the ceiling. At the highest point the grill only projects down 0.5-inches from the ceiling. The electronically balanced centrifugal blower wheel assures maximum ventilation with minimal sound. Easily install the fan by using the included adjustable hanging brackets and the side access panel allows you to wire the fan without removing internal components. The 4-inch round duct connector with gasketed damper protects against back drafts from entering the room. The motors are suitable for continuous use. UL listed for installation over a tub or shower when wired on a GFCI circuit. 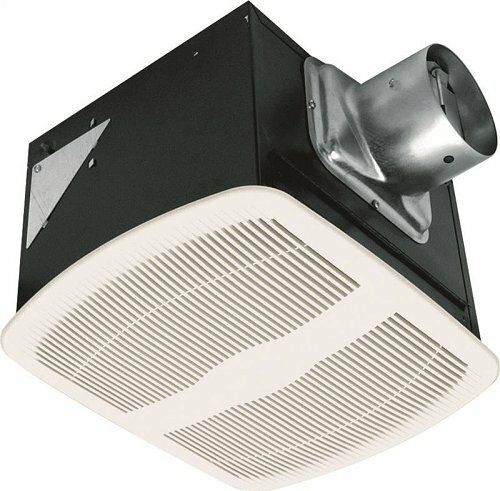 This unit features a 110-CFM blower at 1.5-sone which makes for quiet operation, an exhaust capacity for rooms of approximately 110-square feet, housing that measures 10.875-inches wide by 9.375-inches deep by 7.875-inches high and is HVI certified. The Air King AK110LS Energy Star Deluxe Quiet Series Bath Fan comes with a 5-year limited warranty. Air King offers a full line of industrial grade and commercial grade air circulating fan solutions to meet almost any need you might have. Whether your need is in industrial settings such as manufacturing plants and warehouses or more commercial setting such as offices, schools or hospitals - Air King has the perfect solution for you. Powerful motors that last for years and years are what Air King's Air Circulators have come to been know as and we are not stopping now. Visit www.amazon.com/airking for more information on Air King and our extensive line of products.